Wading through mountains of medical records, invoices, and other documentation is an everyday reality for many healthcare workers, but it doesn’t have to be this way. While it might be impossible for your organization to go completely paperless right away, there’s a great deal you can do to streamline your workflows and ensure that all the necessary compliance and security standards are met. That’s where a document management system (DMS) comes in. Offering a centralized system for tracking, storing and managing all your organization’s documentation, a DMS provides many benefits to healthcare institutions of all types. When you’re dealing manually with reams of paper documents, mistakes are inevitable. Sometimes, these mistakes might be minor inconveniences that lead to delays, but in the healthcare sector they can have devastating consequences. A DMS eliminates human error by getting rid of all the clutter and ensuring data never has to be entered multiple times into different systems. Since multiple departments will have access to the same documents through a single, centralized web-based portal, they’ll be able to access the information they need quickly, therefore providing patients with faster and more efficient care. Poorly organized files are inherently less secure, and that’s a situation no healthcare provider can afford to have. Although laws vary from one state to the next, you need to retain medical records for up to 10 years, and they’re also subject to HIPAA and HITECH legislation. A DMS provides everything you need to keep all documentation, records, and correspondence safe under a single system, along with the necessary compliance and security controls. Systems tailored for use in healthcare institutions also provide controls for automatically retaining and archiving old records. One of the most obvious benefits of a DMS is that it saves money by driving greater efficiency and productivity. 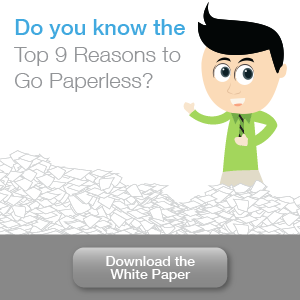 Implementing a DMS is also a big step toward operating a paperless office. It greatly reduces your dependence on printed documentation and all the storage requirements that come with it. For example, with Papersave, the Baptist Child and Family Services organization no longer had to print records and other documents to exchange information. Instead, all the data and documents are centralized, paperwork is digitized, and routine processes are automated, which translates to massive cost-savings. With a web-based DMS, everyone with the necessary permissions can access the same information at the same time. This helps greatly when it comes to enhancing teamwork and collaboration. For example, documents can be retrieved and edited by multiple parties in real time, regardless of where they’re located. This also enables greatly improved workforce mobility, which is fast becoming the new norm in the modern workplace. At the same time, administrators will retain full control over access rights and document permissions. Storing paper documents in filing cabinets is risky, particularly if they’re the only copies you have. Similarly, having digital documents stored in multiple systems makes it much harder to keep track of everything. By consolidating all data under a single system like a DMS, you’ll have only one thing to worry about keeping safe. That’s why every organization should be thinking about incorporating document management into its disaster recovery plan. A cloud-based DMS is even more secure, since any reputable hosting company will have redundant systems in place as well as full-fledged business continuity plans to guarantee the safety of your data. 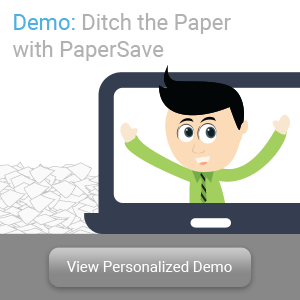 PaperSave is a complete document management system that helps you optimize your electronic workflow for greater efficiency, productivity, and security. 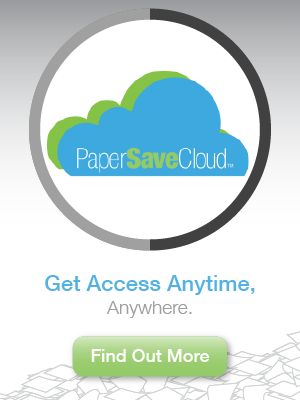 See Papersave in action to learn how you can enjoy these benefits for yourself.